Nothing has been left to chance. Following the principle that wine is born at the vineyard we have devoted our efforts to the selection of grapes grown in the best areas of Mendoza (Agrelo, Chacras de Coria, Lunlunta and Perdriel in Luján de Cuyo). The grapes are carefully hand picked at the right moment, and the process of destemming and fermentation takes place in our modern winery with the most technologically advanced equipment available. The delicate treatment of the fruits ensures that the full flavours of the grapes are not lost and that wines of the highest quality are produced. 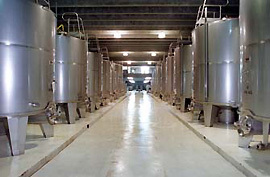 It begins with a cold maceration before fermentation and then are aged in oak barrels. The oak is specially selected from the noblest forests in France and the United States. It supports and blends the fruit aromas and flavors of the wine, giving it a very special richness and complexity.